Strong playmaking continues to power the Georgia Swarm to success. That was evident in the Swarm’s (9-7) 16-10 win Saturday night against the Saskatchewan Rush (13-4) at the Rush’s home SaskTel Centre. Lyle Thompson scored five goals, and a full compliment of his Swarm teammates chipped in throughout the night as Georgia shut down the West Division-leading Rush. It wasn’t just a good effort for the offense, however – goaltender Mike Poulin continued to be key in a 39 save effort. Saskatchewan opened the game strong, with Jeff Shattler scoring the game’s first goal. Five minutes would pass before either team would find the back of the net. Randy Staats’ power play goal tied the game for the Swarm. Staats would also have the helper on Shayne Jackson’s goal 2:30 later that would give Georgia the lead. Jordan Hall added a third goal for the Swarm to give them a 3-1 lead heading into the second quarter. Powerhouse scorer Lyle Thompson jumped out in the opening minutes of the second quarter for Georgia, scoring on a blistering shot. The Rush then got their feet back under them, with Kyle Rubisch and Mike Messenger chipping away at their deficit with two quick goals. But Thompson wouldn’t have any of a Rush comeback. His shorthanded tally reopened the Swarm’s lead. A Kiel Matisz goal sent Georgia into the locker room up 6-3 at the half. The intermission didn’t slow down Thompson, who opened up the second half with a goal just 27 seconds into the frame. Staats added two more, including another power play goal, before Saskatchewan could get back on the board. Ryan Keenan scored his own goal with the man advantage for the Rush. But every time Saskatchewan tried to get back into the swing of things, Georgia had an answer, and Keenan’s goal was no exception. Jordan MacIntosh moved towards Rush goalie Evan Kirk in a flash and scored an unassisted shorthanded goal for the Swarm. Georgia knew that despite a 10-4 lead heading into the fourth quarter, the Rush wouldn’t go quietly. Staats scored his fourth goal of the night, but Mark Matthews quickly answered for the Rush. Thompson added another goal, but then Saskatchewan netted three straight to cut the deficit to just four goals. Who would stop Saskatchewan’s rush but Thompson, scoring his fifth goal of the night. It marked the third time in four games that Thompson would net five. Hall added another tally, pushing the game further out of the Rush’s reach. Messenger and Keenan each tried to get their team back in it, but it was too little, too late. Jackson and MacIntosh added two more goals in the game’s closing minutes to cement the victory. Kirk made 35 saves for the Rush in the loss. 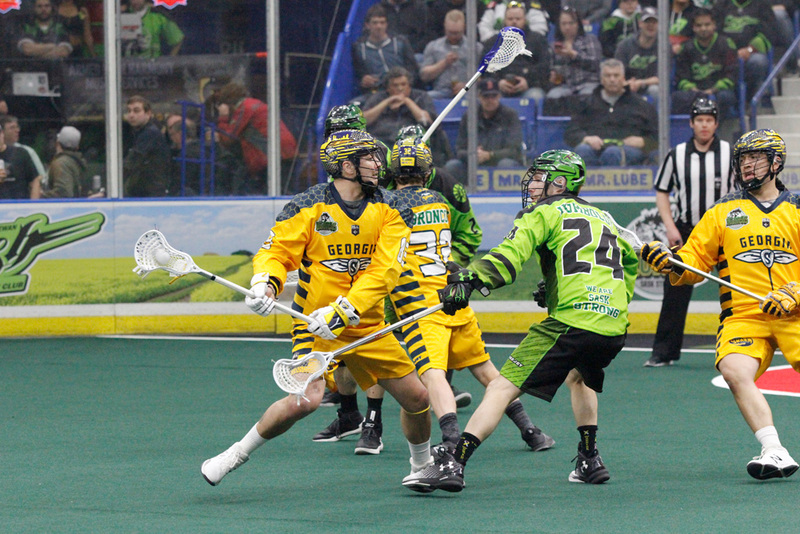 Saskatchewan still leads the West, and will face Calgary Roughnecks next on April 28th. The Swarm move into a tie for first place in the East with the Rochester Knighthawks, and host the Vancouver Stealth also on the 28th.